The Movie Mind likes Broadway shows. As a matter of fact, I like them a lot. So my irritation stemming from this film has nothing to do with being too boorish to appreciate a good theater production. That being said, there’s a reason why Broadway shows are successful while films about them typically are not. Les Miserables is a fantastic Broadway show. It makes for an ok movie. If I’m going to sit through an “ok” movie, it better damn well not be almost 3-solid hours’ worth. There’s actually a lot I can say about this film, surely enough to take up a full review as opposed to a Quick Hit. However, in protest of the disconcerting self-important trend in films these days of carrying on and on without knowing how to wrap-up a film in under 2-damn-hours like it should be, this is all you’ll get. I’m sure you are very broken up about it too. To sum it up: the acting was incredible, sans Russell Crowe. He was basically the only guy in the film who sings like he was voted off the Miami auditions of Season 7’s American Idol. That’s usually not a major problem, unless of course the ENTIRE film is singing. I think there were three spoken words and even those had a little vibrato to them. The issue there is that he plays such a crucial role and really distracts from the other actors that are actually talented. We all know Hugh Jackman is uber-talented, however, the stars of the film were the ones you’ve never heard of and likely never seen before. Eddie Redmayne (Marius), Samantha Barks (Eponine), and Amanda Seyfried (Cosette) were knock-your-socks off amazing. So much so I almost forgot I was sitting there for 1/8th of a day. Almost. The story follows the play very closely. I know this because Mrs. Movie Mind knows every single word to every single tune in the play. Every. Single. One. So perhaps her point of view is much more valid then mine. She did say they added in a new song or two and did a much better job of explaining the actual story and plot than in the stage production. From my point of view as a movie-goer, it certainly wasn’t the typical crap you’d see these days. It was well-made and interesting and beautifully shot, but the filmmakers get no credit for the writing because, well, they didn’t write it. 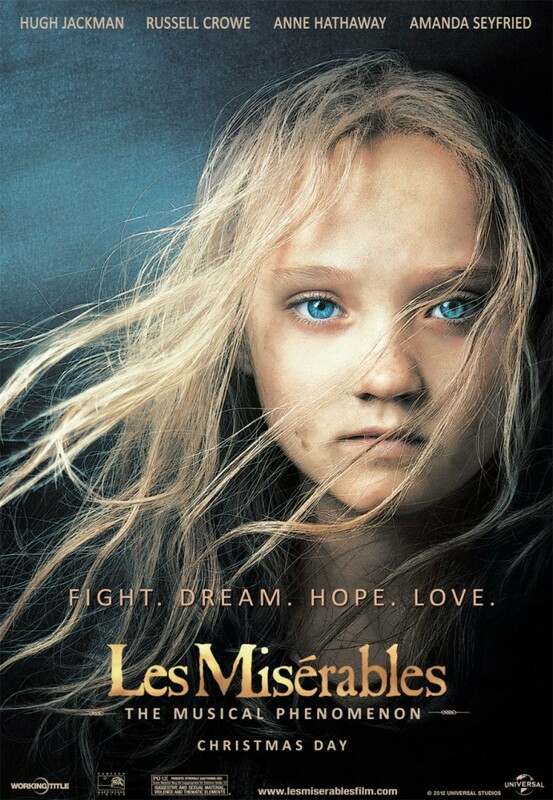 If Les Miserables makes a run back on Broadway in the near future, sign me up. Otherwise chalk this up to a self-indulgent should’ve stayed-on-the-stage rendition of what is actually a great story. Choosing Russell Crowe for such an important part of the story shows they were more concerned about box office numbers then doing the play justice. Very interesting review! I agree and disagree. Agree: Russell Crowe ( I think they did cast him b/c of his name, but he would have been perfect if not for the singing). The unknown actors were excellent and very believable in their parts, Ann Hathaway ( I known not an unknown) was superb & should be rewarded. Disagree: I was not so sure about the length going into the film, but I found the time to go by very quickly b/c I was so engaged. I would reccommend it to others. Oh….I really enjoy your words of wisdom, thoughts & comments and I would totally read a book written by you….you should get on that!! !